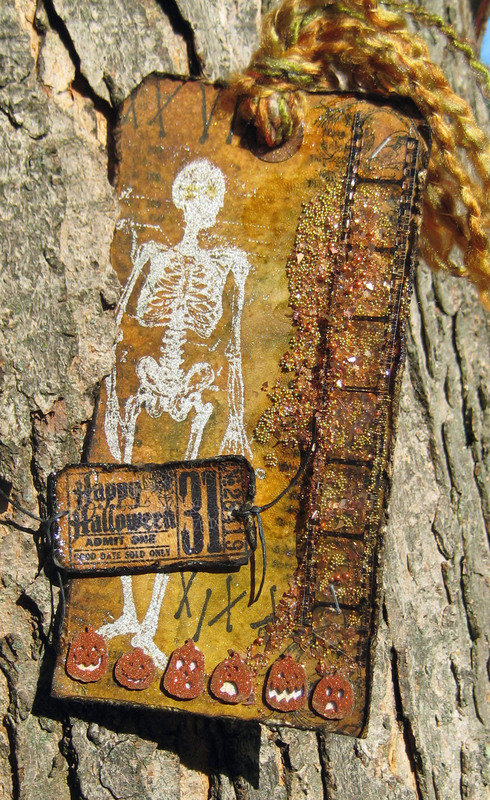 Here’s a skeleton tag you won’t want to hide in the closet! Make no bones about it, I’ve mixed some of my favorite products and colors on this festive Halloween tag and I’m going to share with you how I did it! Start with a blank tag and ink it up using the wrinkle-free distress technique. Stamp your favorite script and flourish stamps on the edges to add some texture to the background. Spritz with colorized misters or make your own to add a hint of shimmer; heat set. Chew up the edges with your scissor blades or edge distresser and darken the edges with Vintage Photo, Walnut Stain and Black Soot Distress Inks. 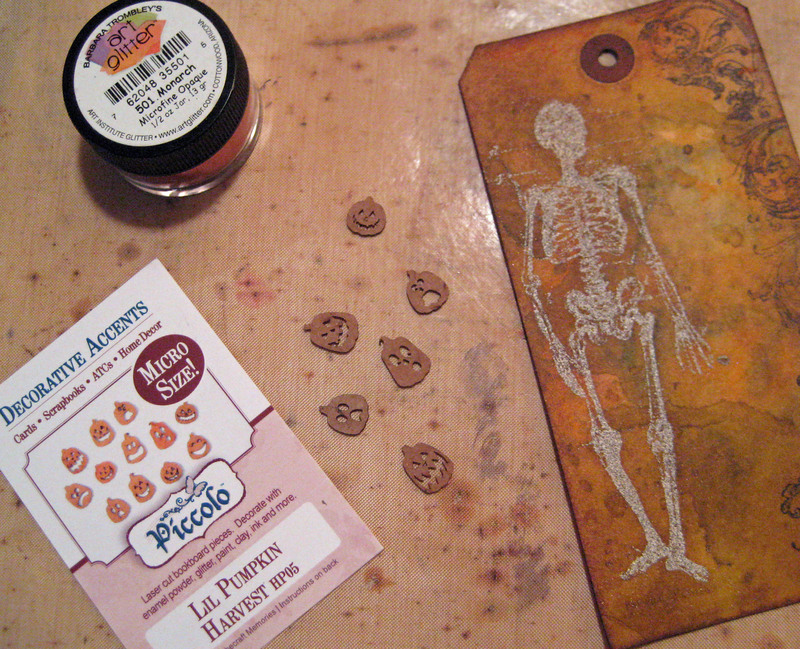 Stamp the skeleton with clear embossing ink and sprinkle on white embossing powder and heat set. When cool, ink over the tag lightly with Vintage Photo Distress Ink and wipe off the skeleton. See how he really stands out from the dark background? 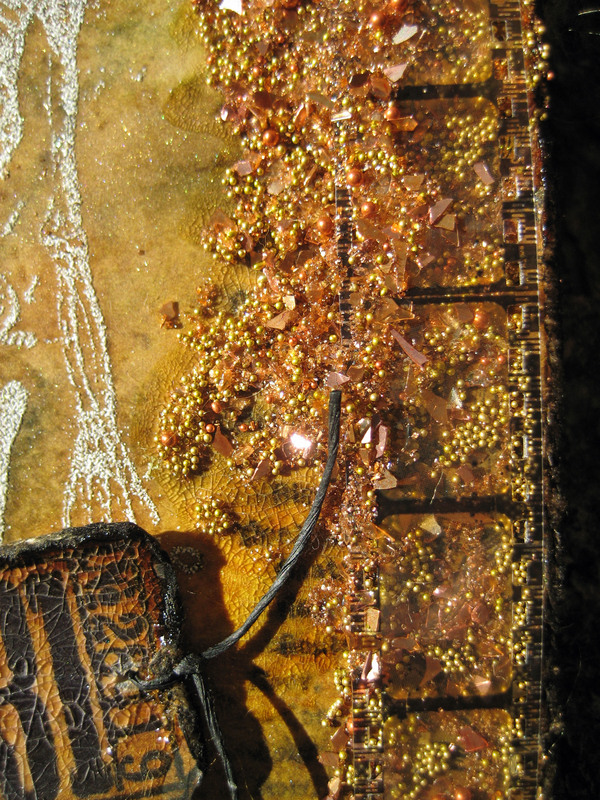 I know I want something to cascade down the side of the tag and discover a jar of Art Glitter Gala Glitz – Orange in my stash. It does the trick – almost! I still need a little something more, so ta-da! Pull out the Art Glitter Small Glass Beads Solar 803 and sprinkle in some. I really like the way things are taking shape now! Punch out the pumpkins from the Globecraft Memories Piccolo Lil Pumpkin Harvest set No. HP05. I’m thinking these will be adorable across the bottom of the tag . I brush them lightly with Designer Dries Clear glue and sprinkle on Art Glitter Monarch 507 Microfine Opaque glitter. It is THE perfect shade; such a nice deep orange. I really want their cute little expressions to show up so I use Art Glitter Sticky Paper on the backs and sprinkle in Art Glitter Winter White Microfine Transparent glitter. They show up nicely don’t you think? So, I’m looking at this tag and it needs more. 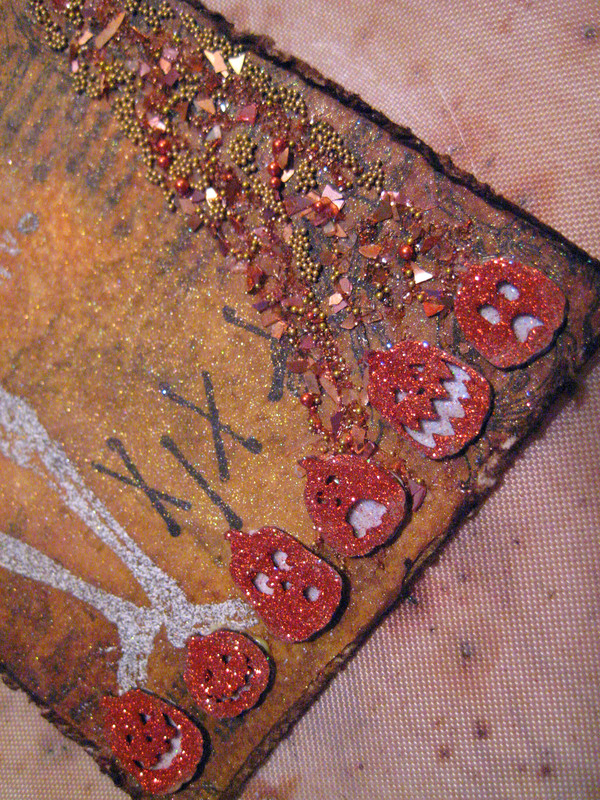 I pull out the Ranger Clear Rock Candy Crackle Paint, stamp a ticket tag with Happy Halloween, distress the edges and spread on the crackle paint. Add a strip of Filmstrip Ribbon down the long edge of the tag and attach with a Tiny Attacher. It needs more Gala Glitz and Small Glass Beads so I slap on some crackle paint over the Filmstrip Ribbon and sprinkle on more Gala Glitz and Small Glass Beads. Look at all those juicy bits and pieces that come out of those two little jars! Love it! I added some black floss to the crackle tag and a variety of yarns to the top to finish it off. I think it turned out pretty cool – how about you? Wanna see more? Visit the Art Glitter blog for more Art Glitter inspiration from me and the rest of the design team! Thanks for leaving a comment! Project-packed weekend retreat sends ’em home happy, glittery & de-stressed! Stickin’, Smoochin’, and Spritzin’…what fun! Great tag! I like how the Gala Glitz and glass beads are both underneath and on top of the filmstrip ribbon! Clever, clever, clever. Your talent shines through, pardon the pun. Wow I love this and the different products together. Great job. WOW, Linda! This is so awesome! You have distressed, and glittery goodness all at the same time!